Two Audio CD Set plus a 16 page full color study guide. * Can "being in the mood" destroy your marriage? * What is the difference between a physically mature male and a Man? * Who is more responsible when a couple divorces - the husband or the wife? * What mistake do women frequently make after the children arrive? Doesn't a good marriage top the list for things that you wish for yourself, your children or your loved ones? Yet too frequently, marriages that start out in joyous expectation end up in pain and disappointment. 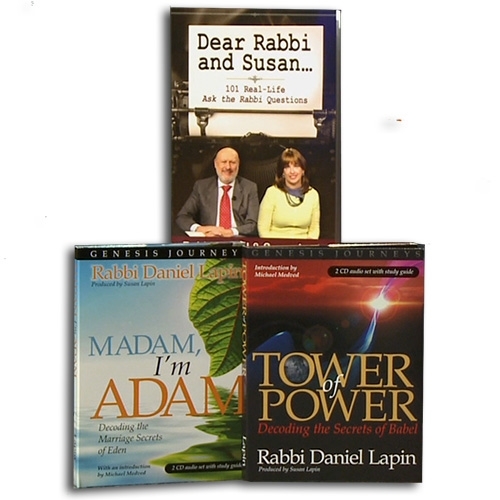 Exploring the world's very first marriage in the Garden of Eden, Rabbi Daniel Lapin shares marriage advice from the Creator Himself. You'll be amazed at how many "modern" issues jump off the pages of the Bible. As always, Rabbi Lapin communicates using wit and compelling eloquence. You will find yourself astounded at how many times you have read these verses without realizing the incredible messages embedded in them. Timeless truths and permanent principles necessary for happy marriage are uncovered through a close examination of the lives of Adam and Eve. If you are married, listening to this audio CD may be the most worthwhile way for you and your spouse to spend an evening. If you are single, the insights revealed just may change your life. And sharing this material with friends and relatives makes a most valuable gift. Majestic and mysterious, loved and cherished, the Bible has been examined and studied for millennia. No other volume has impacted human life more or provided greater guidance and inspiration. Today, many still cherish the Bible and study it faithfully. But most people today, whether Jewish or Christian, are lacking vital learning tools that were available to earlier generations. You can look at Jewish texts that have been handed down for centuries from teacher to student or at the time-honored Ainsworth Bible used in America's colonial churches, and you will become aware of the special role that Hebrew played in helping earlier generations to understand the Bible. Similarly, ancient wisdom that was originally conveyed from God to Moses, from Moses to Joshua and lovingly transmitted orally from parent to child in Jewish households, has fallen prey to our modern impulse to cast away anything old without recognizing its value. In "Tower of Power: Decoding the Secrets of Babel", Rabbi Daniel Lapin will take you beneath the surface of nine seemingly simple verses in Genesis. While enjoying his unique blend of wisdom and humor, you will gain insight into human nature and better understand of the continuing dilemma society faces in choosing whether to live under God's rule or under human control. You will meet Nimrod, the world's first tyrant, and learn how an analysis of his name in Hebrew reveals his essence. As you follow his epic struggle with Abraham you will be amazed at how the methods he employed in his attempt to dominate humanity surface again with Pharaoh and continue to be used by despots today. You will be amazed at how easily even those of us living in freedom and democracy can find ourselves threatened with the loss of those gifts. Gain powerful tools for defending your family, faith and finances as you enhance your knowledge of the best selling book of all time - the Bible.